This system is designed to function above approximately 20 mph (30 km/h). During cruise-speed driving of a manual transaxle vehicle, do not shift into neutral without depressing the clutch pedal, since the engine will be over revved. If this happens, depress the clutch pedal or release the cruise control ON-OFF switch. 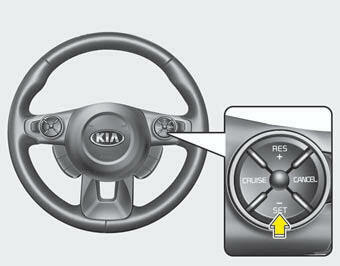 Turns cruise control system on or off. Resumes or increases cruise control speed. 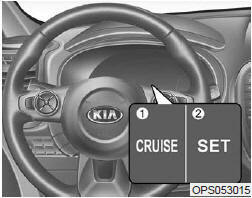 Sets or decreases cruise control speed. 2. Accelerate to the desired speed, which must be more than 20 mph (30 km/h). 3. Push the SET - switch, and release it at the desired speed. The SET indicator light in the instrument cluster will illuminate. Release the accelerator pedal at the same time. The desired speed will automatically be maintained. Push the RES + switch and hold it. Your vehicle will accelerate. Release the lever at the speed you want. Push the RES + switch and release it immediately. The cruising speed will increase by 1 mph (or 2km/h) each time you move the lever up (to RES+) in this manner. Push the SET - switch and hold it. Your vehicle will gradually slow down. Release the lever at the speed you want to maintain. Push the SET - switch and release it immediately. The cruising speed will decrease by 1 mph (2 km/h) each time you move the lever down (to SET-) in this manner. If you want to speed up temporarily when the cruise control is on, depress the accelerator pedal. Increased speed will not interfere with cruise control operation or change the set speed. Decrease the vehicle speed lower than the memory speed by approximately 12mph(20km/h). Decrease the vehicle speed to less than approximately 15 mph (25 km/h). If any method other than the CRUISE button was used to cancel cruising speed and the system is still activated, the most recent set speed will automatically resume when the RES+ switch is pushed. It will not resume, however, if the vehicle speed has dropped below approximately 20 mph (30 km/h). Turn the ignition off. Both of these actions cancel cruise control operation. If you want to resume cruise control operation, repeat the steps provided in “To set cruise control speed” on the previous page.